The Penta 3 is a two roomed corner summerhouse of considerable distinction. 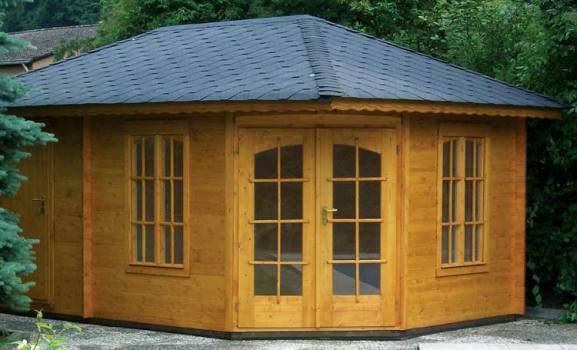 Featuring a summer room with Georgian style windows and doors to the front and a storeroom/shed with its own external door to the rear it is suitable for a variety of uses from summerhouse/shed to garden office/store. Its substantial construction means it is suitable for use all year round and in all weathers and its pleasing appearance makes it a welcome addition to any garden. The corner design maximisises practicality while minimising intrusion. Built to exacting Bertsch design the Penta 3 is constructed in robust Nordic pine logs, double tongue and grooved with chalet milling at the corners for maximum weatherproofing. The floor and roof are of 19mm tongue and groove boards and the building is supplied with pre-treated foundation beams. The summer room features tilt and turn single glazed windows constructed in laminated wood with Georgian wood bars and aluminium weather strips. Likewise the double doors are of laminated wood with Georgian bars, weather strips and fully adjustable hinges. Both the double doors and external door to the back room are fitted with cylindrical key operated locks for added security. The front room is approximately 3 x 3m (9'10'' x 9'10'') while the back room measures 2 x 3m (2'6'' x 9'10''). The building height is 2.1m (6'11'') at the eaves rising to 2.9m (9'6'') at the roof ridge. The windows are a light and airy 1.38 x 0.88m (4'6'' x 2'11'') with the double doors a generous 1.86 x 1.5m (6'1'' x 4'11''). The Penta 3 is supplied untreated for finishing to the purchaser's preference. A factory treatment option is however available. Options include a choice of coloured bitumen felt roof shingles and a roof insulation kit. The Penta 3 is delivered free to the majority of areas with full instructions ready for assembly by the purchaser. See the details of sellers and prices given above. If you own a Penta 3 Corner Summerhouse we'd be delighted if you'd submit a review to help other prospective customers. You can do this on our Corner Summerhouse Review Form - we look forward to hearing from you. Please note that the information given above is taken from sellers and provided in good faith by the Corner Summerhouse Guide. We can't however guarantee the accuracy of the facts stated.